Actually, I have no idea. I just used that title to catch the attention of search engines. In fact, golf was always my least favorite sport after Dad put me to work one summer cutting weeds along the roadside. He issued me a thing with a long wooden handle and a sharp curved blade that looked like something the Grim Reaper uses to harvest souls and sent me out into the hot summer sun to make grass out of weeds. The first time I picked up a golf club, I noticed the similarity between swinging a club and a sythe. I did not want to relive that experience in any form, so I scratched golf off my life list. The guys above are the Central High School golf team. I recognize most of them as being Class of 65, but a whippersnapper or two from ’66 might have snuck in. James Fred Waltz – he was always known as J. Fred as far as I recall – is second from the left in both photos. I mention him because he tracked me down and took me out to lunch at a secret, undisclosed location the last time I was in Cape. Al Spradling was supposed to come along, but he came up with a convenient excuse to ditch us at the last minute. Here’s what Mr. Waltz looks like today. Not only did I not like to play golf, I hated covering it. Fortunately, golf wasn’t a big sport in Missouri, Ohio or North Carolina. Unfortunately, it WAS a big sport in Florida, where golf courses outnumber graveyards. The first couple of years down here, I shot all the biggies at PGA National, Doral and other cathedrals of grass and sand traps. I disliked all of the hoity-toity pretentiousness that went with the sport. The worst guy to shoot was Sam Snead. He hated photographers and always blamed us if he made a bad shot. He reamed me out in front of the whole world one day for – in his eyes – shooting before he completed his swing. When I processed my film, I saw that he had clearly hit the ball before my shutter fired, but it wouldn’t have made a difference if I’d have shown up the next day with photographic evidence. I never could figure out why golfers need absolute silence when a baseball pitcher can throw a rock 90 miles per hour at some batter’s head with 50,000 people screaming in his ear. Arnold Palmer wasn’t bad, but my favorite was Lee Trevino. Here was a man who didn’t take himself or the sport too seriously. He played a relaxed game like he was having fun, joking with the gallery and never saying an unkind word to anyone. 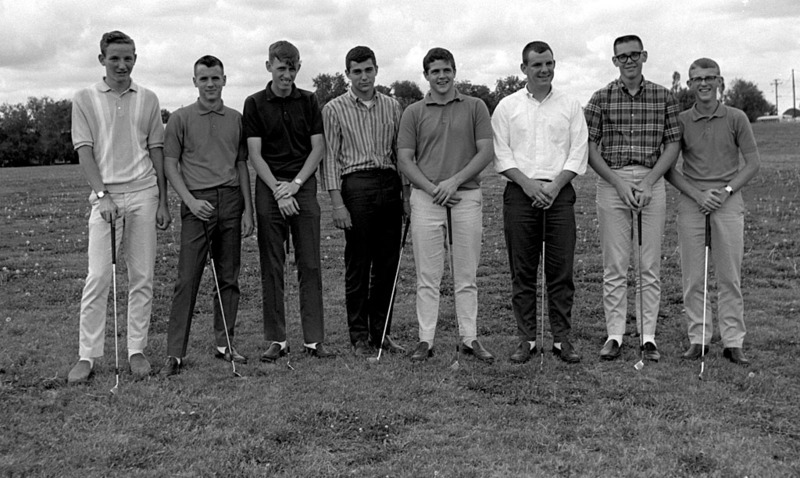 Jim Cochrane is the one guy in the CLASS of 66…I does seem like most of the guys in this picture are now Lawyers. Maybe there is something…nah probably not. I know the whole group of these individuals…and I never have, or EVER would play a round of the evil game of golf with them or YOU. Golf is what you do when you can not do anything else, and I mean anything! I guess that is why Florida has a lot of golf. Sorry, I got carried away. Now back to building that motorcycle for those guys on TV. 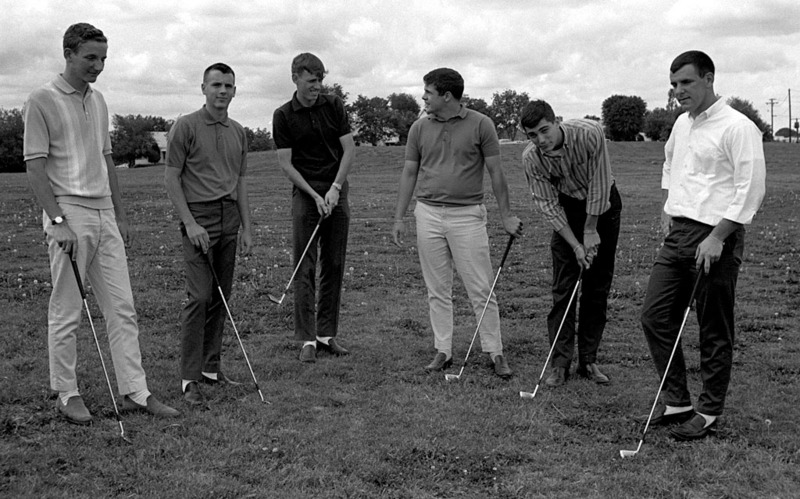 Okay…Mike Young and Ronnie Bowers are in the first picture on the far right. Both class of 1966. Young is one is the “Goofier” looking of two guys with glasses. Well now that I look at the picture again that was not much help, they both look pretty goofy. So to help matters, Young is the guy in the plaid shirt. To my knowledge NO one called Mike Young by his full name or even used his first name…he was always just “YOUNG”. Maybe his Mom, but for sure NO ONE else. Mike Long in his daytime guise. But have you photos of the parade of cars leaving Wimpy’s when some St. Louis city slicker came looking for easy money in the stix, only to peddal home after a beating by Cape’s Milner at the Three Mile Creek drag strip. How about some race shots? I did cover stock car racing at the arena. Good topic at the time of the passing of Riders Cup great Seve Ballesteros. I definitely have too short an attention span to either play or watch much golf, (aside from my obvious lack of talent), but I do like the idea that it is a recreational sport that people can engage in for many years. I see its appeal. One of the promising young rising stars in the world of photo journalism, Ken Steinhoff, is on a very important shoot. Many Thousands of Dollars, all your sponsorships, and your national ranking are at stake. Your assignment is to catch a picture of Sam Snead “exactly” as his club strikes the ball on the 18th tee box of the Masters. You are the only photographer allowed to take this exact photo. Too soon,too late, or off center won’t work, and your successful shoot would be jeopardized. At the very least you would loose several thousands of bucks for missing that essential shot – at that historic time and place. Hundreds of people surround you and are watching you work. “GO KEN…. YOU THE MAN! !” they shout at you as you steady your camera. Millions are watching on TV and there is a close up of you on every TV screen in America. All is quiet…. just the sound a the breeze in the trees in the distance. Sam starts his 100 mph down swing. You are nervous as hell, sweat is running down you face, and you have your moist finger lightly poised above the shutter button. I sneak up behind you at the worst possible moment and quietly whisper, “BOO!” You jump out of your skin, snap the shot a fraction of a second early and your hands move slightly so that Sam’s head is half cut out of your shot! Had you been in Bush Stadium taking a picture of Stan the Man in the World Series with 50,000 fans screaming…. my little trick would not have bothered you at all. You would have been a rich hero, and the toast of the town. There is no comparison Ken. Your comments stung me to the core. I had no choice but to respond in a separate post. Click here to read my rebuttal. Thanks for your comments, though. Very creative. For the record, my son, Trent, did not recognize me. In fact, he thought I looked like Forrest Gump! Others pictured but not previously mentioned . . . Larry McLaird (Dalhousie Golf Club), John David Finch, stockbroker (Stifel Nicolaus) – Jefferson City, Missouri, Mike Gray, engineer retired (Shell Oil)- Houston, Texas. The picture was taken in the Fall of 1965. We were Missouri State Co-Champions in 1964. 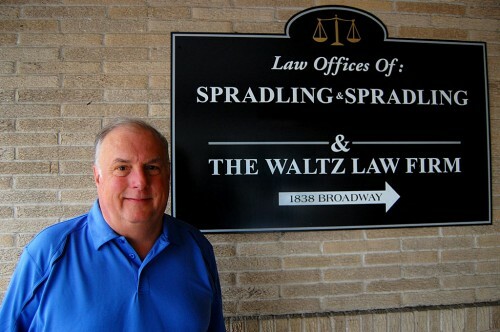 The other member of the team was Jim Reynolds, attorney (Crow & Reynolds) – Kennett, Missouri. For you non-golfers, the senior member of the firm is Sheryl Crow’s father. Quite a group, if I don’t say so myself! P.S. Drag racing was primarily a “night time” activity for “Belly” Long. As with J. Fred, John David Finch was also known by a double name. More importantly, his level of cool allowed him to eschew the white sox fad and stick with the timeless look of dark socks with dark pants. Terry, motorcycles are scary. They leave a whole lot of me unprotected, and all I think about while riding on one is how much of my flesh is going to be scraped off the ground. I’m sticking to golf. I agree with Sally–golf is much safer, even tho, in high school, I thought it was the dumbest game–chasing a white ball, but have changed my mind since I started playing. Great pictures, Ken! Another fine picture of the Cape gentry, each a few years ahead of me. Seeing Belly Long and reading the reference to his racing prowess brought back a fond memory. About ten minutes after getting my drivers license in September 1966, I was driving south on Kingshighway just past William, and moving a bit faster than the limit allowed. Alas, one of Van Riehl’s soon to be compatriots of the SHP pulled me over, lights and siren terrifying me. As was the custom of the day, I exited my vehicle–legs shaking–ready to take my medicine. I handed over my newly minted license as the horrors of losing it so soon bounced around in my head. I never saw my savior coming, but I heard him. Roaring toward us like something out of the days of rumrunning in the hills of Tennessee was the selfsame Belly Long, hellbent for somewhere. The trooper’s head swiveled quickly as Belly sped by, and he turned and said, “Slow it down, son”, tossed my license to me and gave chase. I’m certain it was in vain. All these years later, I finally have the opportunity to say ‘thanks’ to Mike Long.